Das es im Internet zu jeder Frage eine passende Antwort gibt, sollte den meisten Leuten mittlerweile bekannt sein. Das Unglaubliche dabei ist nur: Es gibt WIRKLICH zu JEDER Frage eine Antwort, sogar zu solchen, welche Personen mit einem gesunden Menschenverstand niemals fragen würden. Zum Beispiel diese: Wie viel Dollar würde der Bau eines Todessterns kosten? Basierend auf der Menge der benötigten Materialien und deren Materialkosten, Transportkosten, Löhne der Arbeiter und vielem mehr hab ich eine ausgiebige und glaubwürdige Aufstellung der geschätzten Gesamtkosten gefunden. Ein einzelner Todestern würde demnach exakt 15.602.022.489.829.821.422.840.226 Dollar und 94 Cent kosten. Das sind – in Euro umgerechnet – knappe 12.034.883.100.000.000.000.000.000 1-Euro-Münzen. 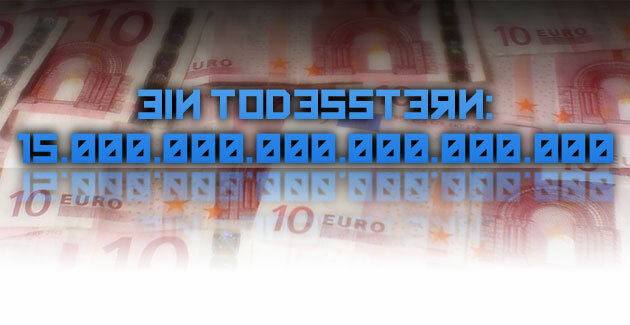 Also 12 Quadrillion Euro. Nachfolgend findest du den originalen englischsprachigen Artikel, welchen ich auf www.rickgold.info fand. One Death Star for $15 Septillion? What a deal! A very, VERY large number, especially when it concerns money. And why is it a deal? Because that figure ignores a lot of very important costs. Costs for what? Why to build a Death Star of course! One evening sitting on my rather run down couch, channel surfing, I came across Star Wars: Return of the Jedi. The scene I happened to tune in to featured multitudes of little space ships flying in and around Darth Vaders behemoth of a killer space station, the Death Star. Thanks the magic of ILM and the imagination of the series creator George Lucas, we get the scale of this phenomenal construct. You see „spacescrapers“ towering over the surface of the moon-like station, valleys that would put the Grand Canyon to shame, and a virtually level horizon line. While watching this, an odd question popped into my head, „How much would it cost to build the damn thing?„. Impossible to figure out? Truthfully … yes. A complete and utter waste of time, absolutely! So why not try and find out! Judging by the figure up there, you’ll know why The Emperor was so pissed when the rebels destroyed his monstrosity, and why he was clearly running low on his budget for the second! So, the „yes“ part up there; there are way too many variables to take into consideration to get an accurate cost on a God-like project like this. Hell, it’s science fiction, it could have been constructed by the snap of some Q-like entity’s fingers. But let’s forget Q’s, Darth Vaders, and an entire bag of impossible things to calculate, and answer what we can. So, first off, what do I base this all on? How about some educated, but none the less arbitrary numbers? Lets say that the Death Star is 1/10 mass for volume. That means 1/10 of the total volume of the DS is something other then empty space or air. And lets say, 6/10 of the total volume is pressurized, livable space. If that sounds off to you, to bad, write your own article, otherwise, keep reading. Using those numbers, lets find what we would need for the most basic of building materials and living requirements, steel and air. Thanks to the internet, we can get all sorts of information on those two things, and come up with fun and impossibly large numbers regarding them! To start our calculations, we need one very important piece of information, just how big is the DS? Thanks to Jeff Russell at www.merzo.net, and his vast database of speculative Star Ship Dimensions, we have an „Official“ diameter of 160km’s. Side note: From here on in I’m going to state decimals and the number, you can find the actual numbers in the „Check My Math“ section below. That gives us a volume of 17.16 quadrillion cubic meters. At 1/10 volume, we’ll need 1.71 Quadrillion cubic meters of steel, weighing in at 134 quadrillion tonnes. In 2008 steel products, from wire to ingots were selling for an average of $962 per tonne, so our cost of steel alone is $12.95 quintillion. Our Nitrogen is going to weigh in at 17.03 trillion tonnes, and our oxygen will tip the scales at 2.24 trillion tonnes. Cost of delivery? Get that pen out and write one of those oversized checks for $2.81 Septillion, and $212.46 quintillion. Add it all up, and we have a figure of exactly $15,602,022,489,829,821,422,840,226 and 94 cents. Tell you what, I’ll pitch in the 94 cents. That is a lot of money. Wait, no that’s a disgustingly large sum of money. How much exactly? $15 Septillion, I told you. But how can we conceive of that number? Well, the figures I could find for the World Economic Value were pretty general, around $14 Trillion USD. In other words, the DS would cost 1.11 TRILLION times the amount of money available in the world, that’s not even including the fact that the majority of that is digital and not physical. How about something else? Say, how much is the Iraq war costing? You see all sorts of calculators out there, but one figure says $343 million per day, and that is a huge waste of money! But you know what? The Iraq war would have to last 124 TRILLION years, or 9,730 time the age of the UNIVERSE to equal the costs of building one measly Death Star. I mean, come now … it’s only one.